Orlando, Florida is one of the most visited cities in the world. It is a coveted vacation spot for people of all ages, nationalities, religions, and interests. Orlando is a very diverse community that is widely known for theme parks, such as Disneyworld, Universal Studios Orlando, Sea World, and some smaller, but interesting other parks. One of the things that very few people know about Orlando is that there is some incredible shopping in the area. That definitely piqued every woman’s attention. There is a place called Orlando International Premium Outlets. They have outlet stores such as Armani, Baccarat, Build A Bear, Coach, DKNY, Lane Bryant, Michael Kors, Polo Ralph Lauren, and so many more. It’s a veritable smorgasbord of store that will certainly please even the finickiest shopper. The only problem is the mall is a madhouse, and the parking area is a nightmare. Luxury Transportation Group USA offers the finest shopping limo services Orlando has to offer. Although the outlet mall is a big draw for visitors to the Orlando area, there are plenty of other malls that will make the avid shopper light up like a Christmas Tree. If there is one thing the good people of Orlando like to do, it’s shop. There are plenty of cool stores for people to explore and browse. The problem is traversing the confusing roads in the traffic that is commonplace to locals, but freakishly stressful to visitors. Rather than getting stressed out and potentially lost, you might want to consider using a company for transportation in Orlando. It’ll make you trip a lot easier and much more fun. 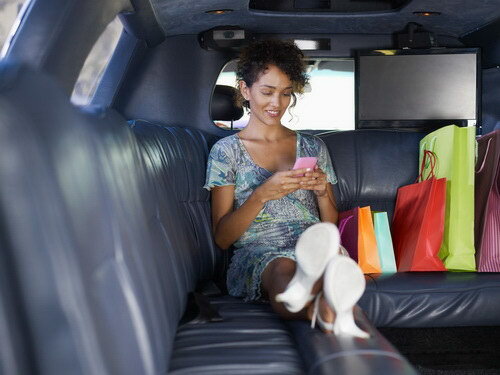 Luxury Transportation Group USA offers a high-end limo in Orlando for shopping excursions. After experiencing the chills and thrills of the theme parks, it’s probably time for you to start looking for gifts and souvenirs to bring home from your wonderful vacation. If you have a rental car, you might want to rethink going to the malls. Rental cars have bar codes on the window, and thieves can spot them from a mile away. They are targets because thieves know shoppers stow their treasures and keep on shopping. You can keep your purchases safe by using a car service. Luxury Transportation Group USA offers safe and secure luxury limos in Orlando. Luxury Transportation Group USA is the premiere provider of limo services in Orlando. Their professional drivers and high end fleet of vehicles will get you to and from your destination safely and on time. Call 407-476-0429 to book limo services for shopping in Orlando.